Natcoweb provides excellent network options that your business can rely on. Our network infrastructure includes a blend of Tier One and Tier Two providers, it allows us to create excellent conditions for data transfer. 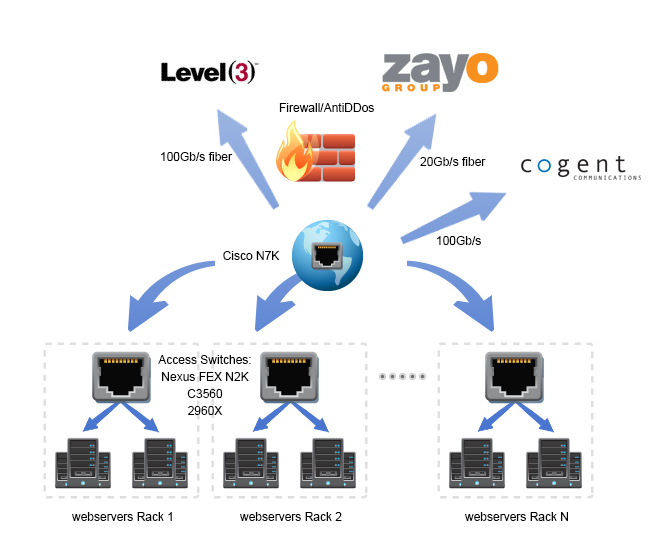 Natcoweb offers 2 bandwidth solutions for dedicated and colocation hosting customers: Premium network, which is a blend of Level3, Cogent, and Zayo and Value network ("pure" Cogent). You won't observe any significant difference in speed between Premium and Value solutions, what really makes difference is network redundancy, we offer 100% network uptime for Premium and 99,999% for Value. If any of the providers in Premium channel goes down, the traffic is routed via the other two available at the moment. In Value - if by any chance Cogent goes down (which has never been the case for 2-3 years we've been using them), the traffic will be switched manually to Level3 or Zayo. More details about our network our network and Datacenter.